A simple, uncluttered professional design with just the right mixture of color and graphics to keep it interesting while not stealing attention away from the words themselves. 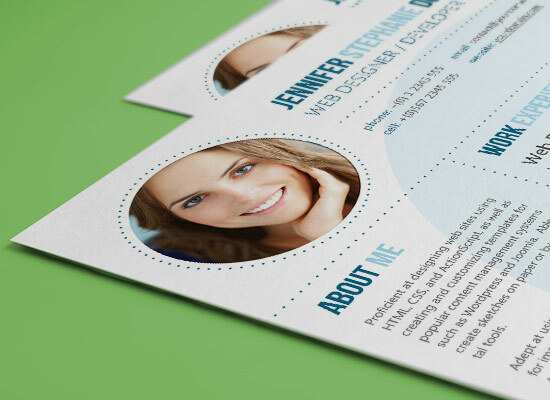 Includes a large rounded area for the applicant’s photograph. Perfect for use when image is nearly as important as the resume itself. Once the checkout process is completed, you’ll be asked to upload your resume content along with any instruction you may have such as your color preference in case you purchase the custom color option. If the selected design has a room for a photo, you will need to upload it as well. We will then custom typeset your CV content using the selected design and send you a high quality and print-ready PDF file by email. For more information, we invite you to read our FAQ or to contact us. ResumeBaker © 2013 All rights reserved.